Home→My Projects→Uncle. And two babies! Uncle! As in throwing in the towel. Tapping out. Giving up. The Lessa Grafting Project is humanly possible, but not by this human at this point in time. I have enough challenges in other areas of my life that I can’t really enjoy this one. So, having plenty of yarn (amazing but true! ), I’m going to keep knitting down to the hem all over again. I have found that the main difficulty, other than grafting the complex cables, is in keeping track of where I am. The bottom section of the sweater is identical front and back, but it really does make a difference which way it goes, because if the beginning-of-rounds don’t line up at the proper side ‘seam’, it will be off a row on either the front or the back. About the time I think I’ve gotten my bearings, the grafting looks funny and I decide that perhaps I’ve got it half-rotated, and get frustrated and set it aside… only to pick it up a few days later and repeat the whole fruitless process. The upshot of it is that if I want to actually finish and wear this sweater this winter, I’d better just forge ahead with re-knitting the bottom section with fresh yarn. Having made that decision, I feel lighter and happier. I’ve never regretted hacking it apart, and I’ve learned a few things through the whole process. As usual. You’d think I’d know it all by now, with as much trial-and-error experience as I have! Next, I get to find out how good my notes were the first time around, and whether I’ll be as happy with the finished hem as with the original. 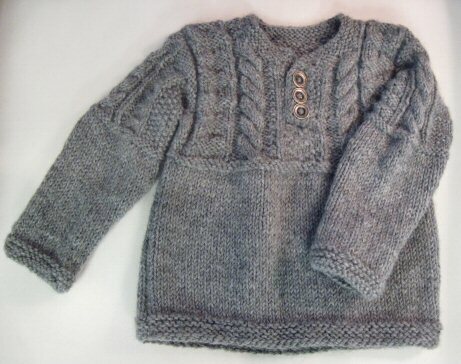 Here’s the younger grandson’s Gansey-Henley sweater. 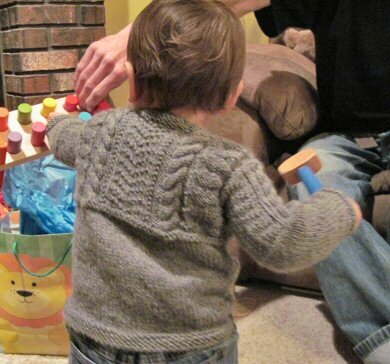 I may have to subtitle that one the Double Birthday Sweater – I realized that I started knitting it on MY birthday, and finished it on HIS (first) birthday. Such a nice little coincidence. He’s growing so fast, I only hope he’ll be able to wear it through the winter! 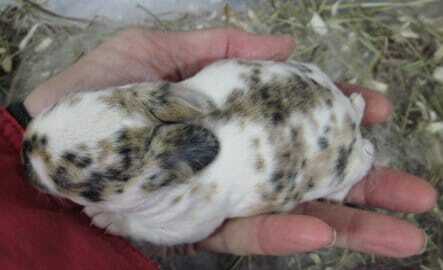 The picture below is of one of the kits in a recent litter of Mini Rex rabbits. Its color pattern is SO lovely, I just had to share it! The variety is called tricolor; and no matter how selectively you breed, there is always a large element of chance about how much and where those colors are going to land. The idea is to have the darker and lighter colored spots on the white as balanced as possible, and while the size and placement of the spots in this breed (within the stated parameters) don’t really count for much on the judging table, such a pretty pattern is really eye-catching! As time goes by and this little one grows up, I will find out if the quality of the body underneath and the coat carrying the colors measures up to the quality of the pattern. 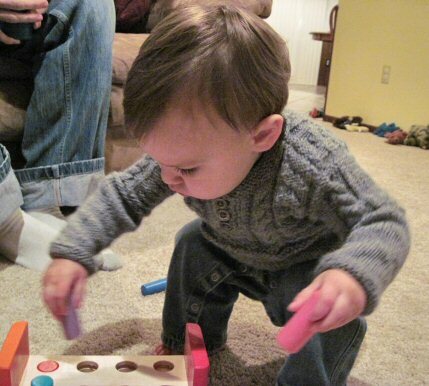 Oh, it IS fun to watch babies grow, isn’t it? The marvels of the Internet! I Google Beverly Royce, and I come upon your blog. I still don’t know who you are or where in Kansas you live. But I have been sorting and cleaning lots of old things in our garage/attic in MN. My spinning wheel, wool cards and kniddy knoddy stay. But old fleece, random yarn snippets and other sundries have to go. I have a plastic bag filled with letters and notes from Beverly Royce, whom I once met at a Shell Lake WI knitters’ camps that Elizabeth Zimmerman and Meg Swanson offered in the early 1980’s. The letters are addressed to Jean, who owned a yarn shop in Grand Marais MN and whom I did not know (but a Grand Marais friend did). Somehow the friend inherited this Bev Royce bag of goodies and passed them on to me. Having read your blog I’m thinking that you might be the rightful inheritor of these items – her first skein of merino yarn, a double-knit glove, several samples of knitting with her handspun yarns, letters, handwritten explorations and explanations. Let me know if this is something that you might be interested in.